A life-long horse addict, Sharon has enjoyed eventing, dressage, trail-riding gaited horses and more. Her intro to behavioral science was via mentorship with Dr. R.K. Anderson (Dip ACVB), shortly after she founded Premier Pet Products. 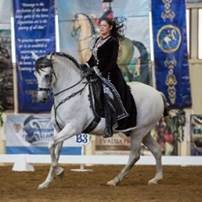 Sharon is a Certified Horse Behavior Consultant (IAABC), member of ISES, a boutique breeder of Iberian horses, and trains & competes in artistic Classical riding. She sees individual behavior cases, conducts workshops and wet-labs, lectures to veterinary students, and consults with upper level competitors – focusing on the science of learning and positive reinforcement training to improve welfare, increase safety, and enhance higher level riding performance.